My last post to the Hurricaneville Blogosphere mentioned that there was a period of peace and tranquility following the demise of Hurricane Helene in the Central Atlantic. Well, that period only lasted for three days. On late Wednesday afternoon, the ninth depression of the season formed in the waters of the Central Atlantic. Then, this morning the depression, which was already close to storm strength, became the ninth named storm of the season, Isaac. Isaac is just a minimal tropical storm with sustained winds of 40 mph, and a minimum central pressure of 1008 mb, or 29.77 inches of Hg. Its circulation is quite disorganized, and will have a very difficult time getting much stronger despite being forecast to intensify to have 50 knot, or 60 mph winds before becoming extratropical in three to four days. A cold front, which recently departed from the East Coast of the United States is serving as a mechanism that will help curve Isaac out to sea, and prevent it from strengthening into a hurricane. So this storm is just another in a recent series of storms to basically be a threat for the fishing and shipping interests in the Atlantic. To date, the 2006 Atlantic Hurricane Season has had five of its nine named storms follow this similar track in the Central Atlantic: Debby, Florence, Gordon, Helene, and now Isaac. Only Florence and Gordon came closest to making direct hits on land as Flo moved just to the west of Bermuda while Gordon passed south of the Azores. While the storms have been either merciful or directed away from land, there still has been a bit of activity in the tropics the past six weeks or so. Since August 20th, there have been six named storms, four hurricanes, and two major hurricanes in the Atlantic Basin. Overall, the 2006 season creeps closer to the fifty year average with nine named storms, four hurricanes, and two major hurricanes. With still a bit more than two months to go, it is very likely that this season will hit the fifty year average in terms of named storms. It is also quite possible that this season could equal the average for hurricanes. So despite the development of a new El Nino cycle, we could still have our eleventh season in the past twelve years with double digit named storms. No other period since records began being kept in 1851 has come close to matching this level of activity. Several periods are worth mentioning, but they still pale in comparison to the prolific activity set during this present era. From 1932 to 1936, four out of those five seasons had ten or more named storms. The same occurred four straight years from 1942 to 1945 while the most active period before this latest cycle was from 1949 to 1955. During those seven years, six seasons had ten or more named storms. That period ironically was a memorable period for landfalling hurricanes in the United States. During that era there were such storms as Dog (1950), Easy (1950), King (1950), Carol (1954), Edna (1954), Hazel (1954), Connie (1955), Diane (1955), and Ione (1955). The seasons 1954 and 1955 in a sense rivaled that of 2004 and 2005 since those two seasons in the mid 1950s captured the country’s attention, especially the media and politicians much like the last two seasons have with Charley, Frances, Ivan, Jeanne, Katrina, Rita, and Wilma. As a matter of fact, following the 1955 Hurricane Season, President Eisenhower created a special commission to investigate what had been happening with the weather, and the findings of that commission eventually led to more funding for hurricane research and such efforts as Project Stormfury. Today, similar calls for more research are being made. Keep in mind also that this latest cycle has occurred during an era in which forecasters have more sophisticated technology to work with and detect and track such storms. Another thing to note about the 2006 Atlantic Hurricane Season is that, we have had all nine depressions that formed this year eventually evolve into tropical storms. Last year, thirty-one depressions formed and twenty-eight of them went on to become storms in the busiest season ever. Back in 1995, the last really hectic season in the Atlantic, there were 21 depressions, and 19 of those went on to become at least tropical storms. The last two seasons to have each of its depressions go on to become at least named storms were 1996 (13 depressions and 13 storms) and 1998 (14 depressions and 14 storms). Good evening everyone. On this first anniversary of the second worst hurricane to affect the United States in 2005, Hurricane Rita, we are enjoying some tranquility for the first time in about a month to six weeks. Hurricane Helene, which had become the strongest hurricane of 2006 on Monday morning with 125 mph winds, and a minimum central pressure of 28.17 inches of Hg, or 954 mb, weakened to a tropical storm on Sunday morning, and then by noon it became extratropical. This season has been one for the fish and ships. Of the total of eight storms, four hurricanes, and two major hurricanes, only Alberto and Ernesto have made any impact on the United States while Florence tracked just west of Bermuda and brought its strongest effects to the island. Storms such as Gordon and Helene steered to the East of Bermuda, and bypassed the Azores although the Portuguese island chain has felt tropical storm force and gale force winds from the two systems. So the tranquility of the 2006 season has been a welcome break after the frenetic activity of 2005. Nonetheless, there is still a bit more than two months to go in this year’s Atlantic Hurricane Season, and since we are in an active cycle, nothing can be ruled out. As I view the satellite imagery from both Atlantic and Africa, I do see some possibilities. Now, of course, the wave associated with a 1009 mb low in the Central Atlantic some 1,000 miles to the East of the Northern Leeward Islands doesn’t appear to be the next named storm, or even a depression for that matter. According to the latest Tropical Outlook from the National Hurricane Center, upper level winds have become less favorable for development while the shower activity has become poorly organized. There is another area of disturbed weather to the east of that in the Eastern Atlantic. This wave just left the African coast over the past day or so, and has a nice spin with it. Just have to see whether or not that the convection will become more bountiful, and organized. Then, across the African continent, there is a decent pipeline of shower and storm activity from the Atlantic coast to out in the Arabian Sea. So, I feel that we shouldn’t rule out the chance for another storm in the next week or two especially while we are still in the peak season period. On top of that, I repeat that Octobers and Novembers during this recent active cycle have been quite hectic. Moral of the story: Don’t let your guard down, and make sure you’re prepared. The last time I wrote to you here on the blog, Hurricane Helene was just shy of becoming the strongest hurricane of the 2006 Atlantic Hurricane season. Winds were at 120 mph and pressure had dropped to 28.29 inches of Hg. Well, shortly after that, some forty-eight hours ago, Helene became the strongest storm of 2006 with maximum sustained winds of 125 mph, and a minimum central pressure of 28.17 inches of Hg. Since that time, Helene has weakened a bit. Weakening to just below major hurricane status with 110 mph winds within the past 24 hours, Helene is still a Category Two Hurricane, but weakened slightly more with winds decreasing to 105 mph as of the 11 AM EDT Advisory on Wednesday morning. The good news is that Helene will not be paying a visit to the United States, or Bermuda for that matter. 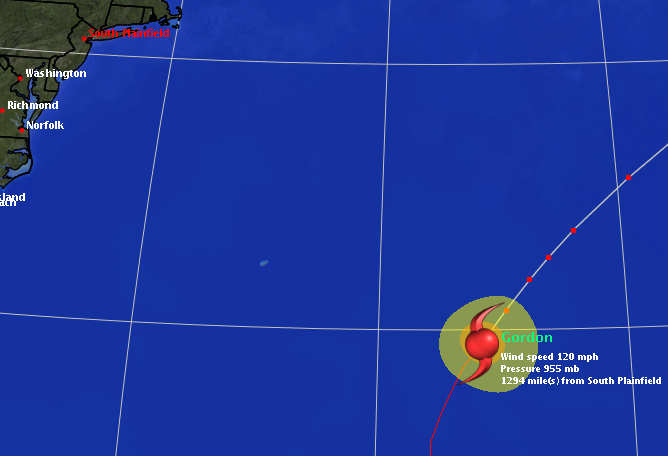 The storm, which is currently located some 670 miles Southeast of Bermuda, is moving to the Northwest at 12 mph. The storm is anticipated to turn gradually to the north over the next day or so. Meanwhile, out in the Eastern Mid-Atlantic, we are still dealing with Gordon. The once major hurricane, picked up steam over the past several days, and strengthened to have winds of 105 mph just as it was passing to the south of the Azores. Now east of that island chain, Gordon is now a tropical storm with winds of only 60 mph, and a barometric pressure of 995 mb, or 29.38 inches of Hg. The storm system is moving rapidly to the East at 33 mph after moving as fast as 35 mph. A gradual turn to the East-Northeast is expected with time. Gordon is also expected to become extratropical, but could pose some problems for Western Europe, especially France, Portugal, and Spain. Helene has become a vast storm with hurricane force winds extending some 60 miles from the eye while tropical storm force winds extend some 230 miles. When the storm system was at peak intensity in the mid-morning hours on Monday, the hurricane force winds only extended some 50 miles while tropical storm force winds reached out some 200 miles. The storm grew bigger as a result of its decrease in strength and wind speed. Hurricanes grown in size as they decrease in intensity in order to satisfy the conservation of angular momentum. While Helene is a large storm system, it is nowhere near as large as Florence was. As Florence pulled away from Bermuda out to sea, its hurricane force winds extended some 70 miles while its tropical storm force winds had a reach of 415 miles from the center. Meanwhile, Gordon was a much smaller storm. At peak strength, Gordon had a radius of hurricane winds that was 30 miles while the radius of tropical storm force winds extended some 140 miles. As it approached the Azores and reintensified to a strong Category Two Hurricane with winds of 105 mph, Gordon’s hurricane force winds extended some 40 miles and its tropical storm force winds reached out some 115 miles. Prior to being downgraded on Wednesday morning, Gordon had expanded in size with hurricane force winds some 45 miles from its center, and tropical storm force winds some 230 miles from its center. Elsewhere, in the Atlantic, we are still watching a non-tropical low pressure system as it approaches the Canadian Maritimes. 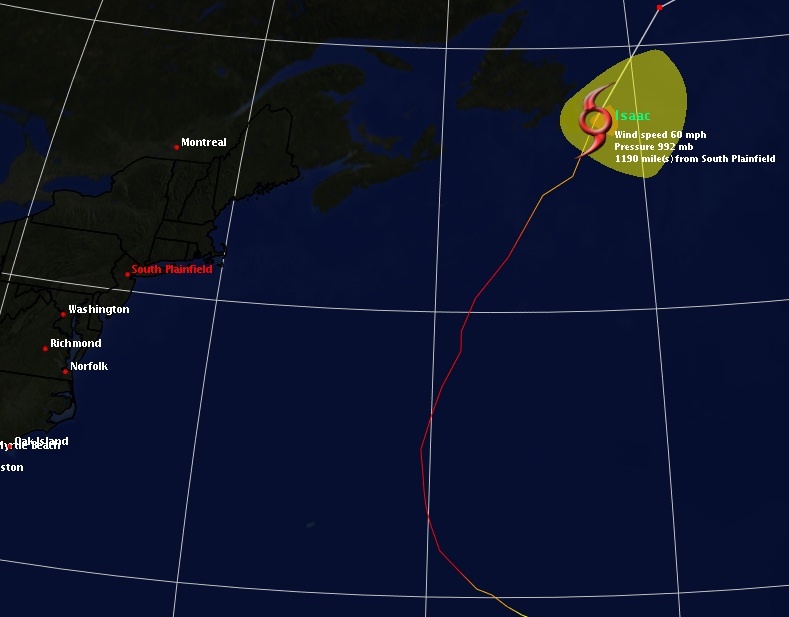 Approaching Eastern Nova Scotia, the storm system is moving briskly to the Northeast at 25 to 30 mph. It has weakened some over the past day or so, and development is not expected at this time. Meanwhile, in the far Eastern Atlantic, the tropical wave that rolled off the West African coast on Monday, continues to progress westward at 10 to 15 mph. Positioned some several hundred miles to the Southwest of the Southernmost Cape Verde Islands, this wave accompanied by a broad area of low pressure, has the potential to develop over the next couple days. Not Fair To Compare 2006 to 2005! It was there for all to see throughout the morning shows on the Weather Channel on Monday. The 2006 season just doesn’t measure up to what transpired in 2005. As of Monday morning, there were half the number of named storms, hurricanes, and major hurricanes in the Atlantic so far to date in 2006 as there was at this same point in 2005. Although the 2006 season has been below par, it has had to deal with an oncoming El Nino episode, cooler than expected sea surface temperatures in the Atlantic, and hostile upper level conditions. Nevertheless, with this latest resurgence, the 2006 season is finally coming into stride, and things have been very busy in the Atlantic. It is simply not fair to compare the 2006 Atlantic Hurricane Season as well as many others on record since 1851 with the 2005 season. Even those unique seasons such as 1933, 1969, and 1995 can’t even compare with 2005. To compare 2006 to 2005 is not like comparing apples and oranges, but a grape with a grapefruit. So, to see weather forecasters on CNN and some of the major networks compare this season to last season is doing the public a disservice. What really surprises me is that with all the technical people behind the scenes at TWC’s Hurricane Central, is that the Weather Channel, the standard bearer in the media for all things meteorological, has fallen into this same trap. Hey, if you want to compare 2006 versus the fifty year average from 1950 to 2000 fine. Want to see how it measures up with other seasons during this recent active cycle from 1995 to the present? Sure. Perhaps you could even compare it to the 155 year average from 1851 to 2005. OK. But, don’t compare this season with the mother of all seasons as far as hurricanes go. Give me a break! Another thing that really bothers me about this comparison is that the season isn’t over yet by any stretch. We are still in the month of September, which is peak time for tropical systems in the Atlantic. Go back in history at some of the biggest storms to hit the Northeast for example. The Long Island Express of 1938 struck on September 21st, The Great Hurricane of 1815 hit on September 23rd, and Hurricane Gloria came ashore on September 27th. Then you had storms such as Hurricane Hazel, which made landfall along the Carolina coast in October. With so much talk early on in the year about there being a major storm affecting the East Coast of the United States, I think we should at least wait until November 30th before letting down our guard. Folks such as Max Mayfield at the National Hurricane Center have been saying for years that all it takes is one storm, and that we shouldn’t get all caught up with the numbers. Well, the weather media should follow the advice. Sorry that I’ve been away the past several days, but I’ve been busy with work and getting an assignment done for school. I also had some other web sites that I had to work on. Anyway, I’ve been keeping abreast of what has been happening in the tropics the past few days with an update of the site from time to time. Nevertheless, a lot continues to happen in the Atlantic. We now have our second major hurricane of the 2006 season as Helene continues to strengthen in the Central Atlantic. With Helene strengthening to Category Three on the Saffir-Simpson Scale, we have had a total of eight named storms, four hurricanes, and two major hurricanes. Those totals are exactly half of what we had in the Atlantic up to this same point in 2005. However, it is a bit unfair to compare this season to the 2005 season since that year was way off the charts in terms of activity. As a matter of fact, despite the quiet start, the season is on par to be at least normal compared to the fifty year average from 1950-2000, and could actually meet some of the latest forecast numbers by both Dr. William Gray and NOAA. We are still in the active period for Atlantic storms, and it is still possible to see a storm or two by the end of September. October has also been active, especially in recent years with such storms as Opal (1995), Mitch (1998),Keith (2000), Michael (2000), Iris (2001), Stan (2005), and Wilma (2005). Helene currently has winds of 105 knots, or 120 mph with a barometric pressure of 958 mb, or 28.29 inches of Hg. As of the 5 AM Advisory from the National Hurricane Center. The storm system is moving slowly to the North-Northwest at 7 mph, and is located some 920 miles to the East-Northeast of the Northern Leeward Islands, or about 1160 miles to the East-Southeast of Bermuda. By the way, we also still have Hurricane Gordon, which has been quite resilient some 1245 miles to the West of the Azores. However, Gordon is projected to become extratropical over the next 36 hours. Back to Helene, it is forecast to become stronger, and it could take the place of Gordon as the most powerful storm of the season. At peak intensity, Gordon had maximum sustained winds of 120 mph, and a minimum central pressure of 955 mb, or 28.20 inches of Hg (Mercury). Now, Helene has matched those peak winds, and is only several millibars off of Gordon’s lowest pressure. The chances for strengthening should increase to as a trough of low pressure in the vicinity is expected to lift out. 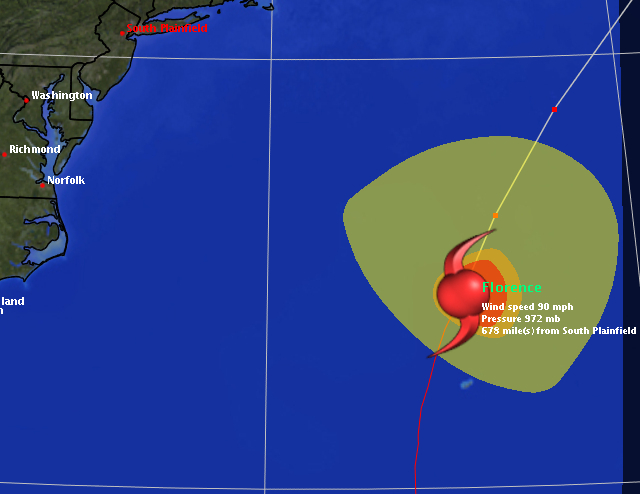 Helene is the fourth storm in the Atlantic to miss the Lesser Antilles, and curve in the direction of Bermuda. Previous storms that have followed this general path in 2006 have been Debby, Florence, and Gordon. So, here’s been the trend for landfalling storms and other storms trajectories during this active period. In 1995 it was the Florida Panhandle with Allison, Erin, and Opal. From 1996 to 1999 it was the Atlantic Coast, particuarly North Carolina. Both 2000 and 2001 had many of the big storms affecting the Southwestern Caribbean and Central America while 2002 saw several storms threaten the Central Gulf Coast of the United States. The following year, 2003 saw the major storms such as Fabian and Isabel affect Bermuda and the Atlantic coast. Florida was hit hard by hurricanes in 2004 and the Central Gulf Coast and Florida took a pounding in 2005. Beyond Helene, there isn’t much to worry about in the tropics at the moment although there is a non-tropical low located several hundred miles off the Carolinas this morning. It is expected to merge later this week with an approaching cold front that has been producing severe weather in the Midwestern United States. However, another large wave is about to enter the Atlantic off the West African coast. So, we’ll have to watch it over the next several days. Moving over into the Eastern Pacific, we still have some activity with Miriam still a depression after forming over the weekend. Lane made landfall some 20 miles to the Southeast of El Dorado along the Mexican coast, and its remnants is feeding moisture into the United States and helped contribute to this weekend’s severe weather. Over in the Western Pacific, Typhoon Shanshan crashed ashore in Japan with winds as high as 100 mph, and torrential rains. Some of the highest winds in the storm blew over a train, which is an incident reminiscent of the Labor Day Hurricane of 1935. Well, I updated the site several hours ago. Sorry for the delay, but I fell asleep at about five o’ clock on Wednesday afternoon, and didn’t wake up until 12:30 AM Thursday morning. Working nights can really throw a monkey wrench in your sleeping patterns. Thank goodness I do shift work so that I can spend a couple more days at home recovering. I also was busy doing work on other projects including getting things started on my fall league coverage for GMC Hoops. Anyway, a lot has transpired since I last reported to you about the tropics. The third hurricane of the 2006 Atlantic Hurricane Season, Hurricane Gordon, became the season’s first major hurricane with 120 mph winds, and a minimum central pressure of 955 mb, or 28.20 inches of Hg (Mercury). The storm, which has an eye that is between 30 and 40 miles wide, was located about 555 miles to the East-Southeast of Bermuda in the Central Atlantic. Fortunately for both Bermuda, whicch is still recovering from the impact of Hurricane Florence on Monday, and the East Coast of the United States is that this storm will only be for the fish and ships as it is expected to stay out at sea, and eventually weaken. Further to the South and East, we have a new tropical storm in the Atlantic. Tropical Depression Eight, which formed well out in the Eastern Atlantic some 185 miles to the Southeast of the Cape Verde Islands off the West Coast of Africa, strengthened on Wednesday to become the season’s eighth named storm of the season, Tropical Storm Helene. 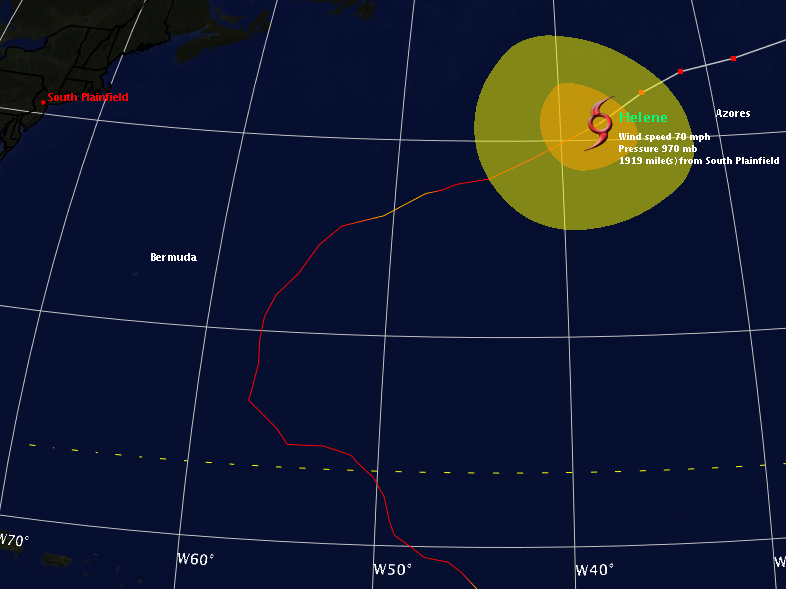 As of Wednesday night, Helene was centered some 565 miles to the West of the Southernmost Cape Verde Islands. This latest tropical storm has maximum sustained winds at minimal storm force of 40 mph while barometric pressure in the center of circulation has only dropped slightly at 1005 mb, or 29.68 inches of Hg. Helene, which is a broad circulation, has a good ball of convection, but it’s core isn’t well developed at the moment. However, conditions are favorable for strengthening, and Helene should become a hurricane within 36 hours, and come close to becoming a major hurricane within 96 hours. Looking at this latest discussion, and seeing what has transpired with Gordon over the last 24 hours, I wouldn’t be surprised at all if Helene, too, becomes a major hurricane. The storm is projected to follow a more southerly route than Florence and Gordon since it will be more under the influence of a ridge despite the erosion of that ridge by a mid to upper level trough that will bypass Helene later in the week. So, folks in Bermuda, the Northern Leeward Islands, and the East Coast of the United States should closely watch the future track of this system, especially over the next several days. Meanwhile, right on the heels of Helene is another tropical disturbance that just moved off the African coast within the past twelve hours or so. It’s close proximity to Helene may inhibit development, but Helene is moving quite rapidly to the West so that may help this disturbance become a depression with time. According to the latest outlook from the National Hurricane Center, there is no mention of the wave while there is discussion of a disturbance in the Lesser Antilles and a strong extratropical system formerly Hurricane Florence. Moving into the Eastern Pacific, there is a new tropical storm out there as well. Tropical Storm Lane became the twelfth named storm of the Eastern Pacific Season, which experienced a bit of a lull after Hector, Illeana, and John. Hurricane John threatened the West Coast of Mexico before moving into the Gulf of Calfornia, and even bringing a great deal of moisture to the Southwestern United States. Lane has prompted tropical storm warning flags to be posted along the Mexican Coast from Tecpan de Galeana to Cabo Corientes. In the Western Pacific, we now have another typhoon in Shanshan. The storm is heading somewhere toward land as it may affect anywhere from the Northern Phillipines to Taiwan to Okinawa. As of several hours ago, maximum sustained winds with the system were at 90 mph, or 150 kilometers per hour, which would make it a strong Category One Hurricane on the Saffir-Simpson Scale. Ever wonder what happened to Hurricane and Super Typhoon Ioke? Well, after the storm, which crossed the International Date Line after passing close to Johnston Island and to the south of Hawaii, affected Wake Island, it recurved to the East of Japan, became extratropical, and merged with another system to bring heavy rains to Alaska last week. 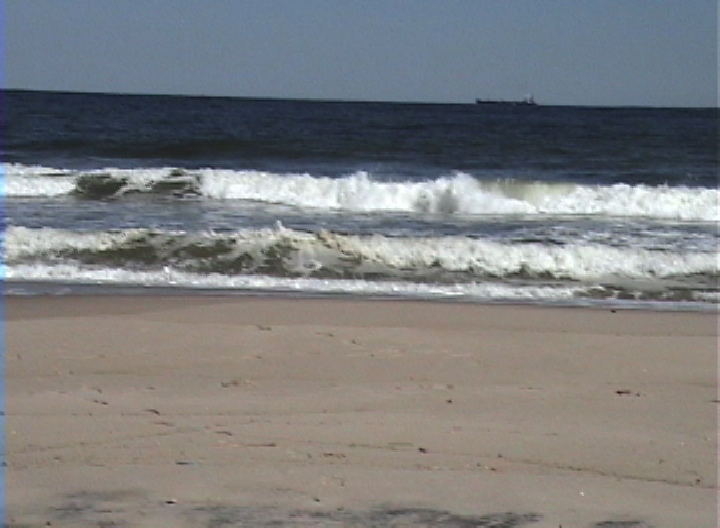 Surf’s Up On Jersey Shore…Well It Was Anyway! Good evening everyone. As promised, I took a trip down to the Jersey Shore to check out some of the wave action and surf from Hurricane Florence on Tuesday. Florence, a very vast and large system, became extratropical this afternoon and that National Hurricane Center issued its last advisory on it. Nevertheless, there were still heavy surf advisories up and down the Atlantic Coast of the United States as well as parts of the Bahamas and Canada. I first traveled to South Amboy, which is not too far from my home, and looked for a place where I could use my video camera to take some footage. I stumbled upon the town’s Waterfront Park, which is a wonderful park with some great views of Raritan Bay. The backdrop to the park are several neighborhoods worth of new town houses and condominiums that have been built within the past several years. Known as the Gateway to the Jersey Shore, South Amboy is a small community of about seven to eight thousand residents. I got as close as I could to the water, and managed to get some footage, but the wave action wasn’t really impressive. Fortunately for folks in South Amboy, and unfortunately for me, the high surf and waves created by Florence’s circulation, were absorbed by the likes of nearby Staten Island, and other barrier islands in the region. Nevertheless, small waves did crash ashore in rapid succession. It was just a tad windy as Florence’s low pressure and high pressure over the Northeastern United States created yet another pressure gradient similar to the one experienced with the remnants of Ernesto almost two weeks ago. After being in South Amboy for about a half hour, I then got back in the car, and traveled down Route 35 to Laurence Harbor’s Waterfront Park. Laurence Harbor is a costal area in the town of Old Bridge. Both Old Bridge and South Amboy are located in Middlesex County, and I can get to both towns with about a 20 minute drive. Like with South Amboy, Laurence Harbor’s Waterfont Park is a very nice park. Never have been to that one either. There were some nice walkways that jutted out into the water as well as large rocks along the coast that provides a bit of a difference from South Amboy’s Waterfront Park. Once again, I came away empty handed since the waves in this location were small, but still continuous. But, that wouldn’t be the case when I arrived at Sandy Hook at 1:30 PM following about a half hour drive. Driving over the bridge leading to Sandy Hook, I saw that the waves and surf were out in full force. There was nothing obstructing the wave energy from Florence’s circulation along this portion of the Jersey coastline. I’ve been to Sandy Hook on several occasions since 2001, and these were the highest waves I’ve seen here in all my visits. According to the Weather Channel over the weekend, and on Monday, seas were expected to run between eight and twelve feet along the Jersey shoreline. I ended up taking footage for about 16 minutes or so. I actually had to get out another tape for my camera since I had used up the remaining tape on the other DV cartridge in viewing the action in South Amboy and Laurence Harbor. You could hear the constant rumble of the waves crashing against the beach. While I got fairly close to the water, I didn’t get in it since there were also rip currents to watch out for. Even if you’re just standing in the water close to the beach, a strong current can still pull you in. There was plenty of foam and whitecaps with the incoming surf. There weren’t a lot of ships and boats in the water on this day. Many I guess heeded the advice to keep their boats in port. The National Weather Service had Tropical Storm Warnings posted for adjacent offshore waters in New York and New Jersey. I was really glad to take the trip out. I gave a thought to traveling down further to Sea Bright and Long Branch, but decided to head back home since I had other things to do. Perhaps the next time a storm affects the area in the form of high surf, I will take a journey down to those two spots in addition to Sandy Hook. Before I begin with today’s entry, I wanted to let everyone know that I shot some video last week of the remnants of Ernesto affecting Central Jersey in two locations: Somerset and South Plainfield. So feel free to check it out. It took a while, but finally the tropics here in the Atlantic are getting active. As of today, we have had seven named storms, two hurricanes, and no major hurricanes. However, over the last month or so, over half of the named storms to form this season have developed with two of them becoming the only hurricanes thus far in 2006. Both hurricanes have been modest with Florence being the strongest of them all with 90 mph winds, and a minimal central pressure of 972 mb, or 28.70 inches of Hg (Mercury). The most recent tropical system to emerge in the Atlantic waters is Tropical Storm Gordon, which is presently located some 445 miles to the North-Northeast of the Leeward Islands. Maximum sustained winds have increased to 60 mph while the minimum central pressure has dipped to 1000 mb, or 29.53 inches of Hg. The storm, which first became a depression on September 10th, strengthened to become the seventh named storm of the season late in the afternoon on September 11th. Gordon is expected to be just a threat for the open waters of the Atlantic. It may give some high surf and blustery conditions to Bermuda, but it should stay well away from the island. The forecast calls for this system to intensify into the third hurricane of 2006 within the next 24 hours. Speaking of Bermuda, the island will probably be very thankful that Gordon will curve to the east after the havoc Hurricane Florence wrought on Monday. Florence, which became a depression a week ago Sunday, came within less than a 100 miles of the island, but the vast storm still had its powerful northeast quadrant pound it. Currently, Florence is undergoing an extratropical transition. What that means is that the storm is converting itself from a warm core system to a cold core system. Tropical cyclones are known as warm core systems since they have warm air rotating around its center while extratropical, or mid-latitude storms are cold core systems since they have cold air rotating from the center. The storm is a very vast one with hurricane force winds extending 70 miles from the center, and tropical storm force winds extending 415 miles from the center. Located some 365 miles to the North-Northeast of Bermuda, or 810 miles to the Southwest of Cape Race, Newfoundland in the Canadian Maritimes, Florence is moving at a brisk pace to the Northeast at 20 mph. While undergoing its extratropical transition, the system is expected to move across the Atlantic, and be close to Ireland later in the week. Finally, we have another area of disturbed weather in the far reaches of the Eastern Atlantic. Centered near the West Coast of Africa, or about 250 miles to the Southeast of the Cape Verde islands, this disturbance has been getting better organized, and may become a tropical depression over the next day or two. Good morning everyone. Well, it has been a couple days since I last posted to the blog. During that time, I’ve posted some video of the effects from Ernesto here in New Jersey last week. I plan to take a trip out to the Jersey Shore on Sunday, or early next week to catch a glimpse of some of the wave action and heavy surf that should be coming as a result of Florence. If I do, I’ll post some video of it here on the site. In addition to that, I’ve been writing down some rough drafts of a book review that I have planned for the month of September as well as an article on Ernesto. So, keep your eyes peeled for those two things in the coming week. Speaking of Florence, it is finally getting its act together after battling some hostile upper level wind conditions thanks to a nearby trough. Maximum sustained winds with the storm, are now 65 miles per hour, and it is forecast to become the season’s second hurricane within the next 12 hours. A Hurricane Watch is now in effect for the island of Bermuda, which appears to be in the direct crosshairs of this developing storm. Barometric pressure in the center of circulation has dropped seven millibars, or 0.21 inches of Hg (Mercury) in just the past 15 hours. Hurricane Hunter aircraft is expected to fly into the storm during the day today to determine the true intensity of the storm. Looking at the latest track courtesy of Eye of the Storm (see the map above), Florence seems to be making a beeline right for the island. The last time the island took a direct hit from a hurricane was in 2003 when Hurricane Fabian, a Category Three storm on the Saffir-Simpson Scale, pounded the island in what turned out to be the worst storm in fifty years in Bermuda. Looking at the latest satellite imagery, Florence has developed a nice core with lots of reds and oranges to indicate the colder, and higher cloud tops. In addition, there is a nice outflow patter developing around the system. The only thing it is lacking is an eye feature. Compared to what it looked like 15 to 24 hours ago, the storm looks much more organized, and a lot like a fledgling hurricane. It won’t be long before Florence becomes the second hurricane of 2006. There has already been some heavy surf and rip currents being reported around the islands in the region including the Northern Leeward Islands, the Virgin Islands, Puerto Rico, Hispaniola, and Bermuda itself. That wave action, high surf, and rip tides are expected to affect the Mid-Atlantic and Northeast Coasts beginning on Sunday, and they could last all the way until Wednesday. Currently, Florence is South of Bermuda and still moving to the West-Northwest, which is making me wonder about this turn to the Northwest, and then North the storm is supposed to make with time. A front is presently moving off the East Coast of the United States, and that is expected to give Florence the projected turn away from the United States East Coast. Now, while I’m no weather expert despite having some meteorological background, I do recall that Hurricane Katrina was initially supposed to cross South Florida, emerge in the Gulf, and then turn toward the north to make landfall near Appalachicola. Well, we know that changed, and for the worst if you live in New Orleans and the Central Gulf Coast. So, I wouldn’t let my guard down completely if I live in the Mid-Atlantic and Northeast. These storms are quite quirky, and they tend to have a mind of their own sometimes. Once again, the key will be whether or not, it makes the 70.0 West longitude line. Best advice, continue to follow the weather reports online, on the Weather Channel, and your local television stations. Hurricaneville Says Hello To Flo! Good morning everyone. I have been working on some kinks with the Greg’s Weather Center web site, particularly the automation side of it including the weather reports uploaded to the internet from my weather station in the backyard. I’ve also added another link to the links page as well as a blog entry on the aftermath of Ernesto in the Mid-Atlantic and Northeast. The tropics continue to be active as another depression formed on Sunday, and then became better organized on Monday, which led to the emergence of Florence on Tuesday morning. The tropical storm developed from a broad area of low pressure that was first an impressive cluster of thunderstorms that moved off of Africa last week. The waves coming off the African coast have been more impressive, and more notably, they have held together better once in the Atlantic Ocean. So far, there have been only six named storms in the Tropical Atlantic in the 2006 season. Of those six, there has been only one that was able to reach hurricane strength. None of the storms were able to become a major hurricane of Category Three intensity or better on the Saffir-Simpson Scale. Seasonal forecasts from both NOAA and Dr. William Gray of Colorado State have been revised downward to have fewer storms, hurricanes, and major hurricanes. As a matter of fact, the number of hurricanes and major hurricanes were predicted to be below average by Gray in his September forecast. The way the forecast looks right now, Florence appears to be on its way to becoming the season’s first major storm despite battling hostile upper level dynamics at the moment. As of the 11 PM EDT Advisory on Wednesday night from the National Hurricane Center, the maximum sustained winds with Florence were at 50 mph while the minimum central pressure has dropped to 1000 mb, or 29.53 inches of Hg. The system is located some 700 miles to the East of the Northern Leeward Islands, or 1160 miles to the Southeast of the island of Bermuda. Florence is moving to the West-Northwest near 10 mph, and that motion is expected to continue over the next 24 hours with an increase in forward speed. The storm is anticipated to become a hurricane within 36 hours, and a major hurricane within 96 hours. As far as Florence affecting the East Coast of the United States, it doesn’t appear at the moment to be a threat. Within five days, the storm is expected to turn to the North between Bermuda and the U.S. Atlantic Coast. The key longitude to watch for is 70.0 West according to Dr. Steve Lyons of the Weather Channel. That particular longitude represents the eastmost point along the United States. If Florence begins to turn more northward before 70.0 West longitude, then it is more likely that the storm will affect either Bermuda, Nova Scotia, or Newfoundland. On the other hand, if it doesn’t, coastal areas from the Southeast Coast to New England should closely monitoring the progress of the storm. As a matter of fact, residents along the East Coast should keep a close eye on the developing situation from time to time.